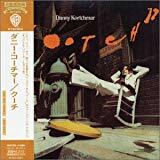 Danny Kortchmar is sometimes credited as Danny Kootch. As an L.A. session guitarist, Kortchmar's work appears on many great albums including Jackson Browne's Running On Empty, Hold Out, and Lawyers In Love; Carole King's Writer and Tapestry; David Crosby and Graham Nash's Wind On The Water; Bob Dylan's Shot Of Love; Ringo Starr's Ringo's Rotogravure; James Taylor's James Taylor And His Flying Machine and In The Pocket; and, of course, several of Harry Nilsson's albums. Kortchmar co-wrote "(Thursday) Here's Why I Did Not Go To Work Today" and "Moonshine Bandit" with Nilsson and co-wrote Don Henley's hit "Dirty Laundry". More recently, Kortchmar has produced albums by Louise Goffin, Don Henley, Neil Young, Hall & Oates, Timothy B. Schmit, Jon Bon Jovi, John Waite, Joe Cocker, Spinal Tap, Billy Joel, Carly Simon, The Fabulous Thunderbirds and others.